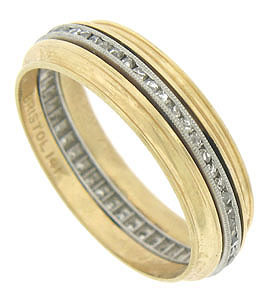 A delicate diamond set platinum ribbon adorns the center of this vintage wedding band. Undulating 14K rose gold bands frame the sparkling ribbon. The Retro Modern wedding ring measures 5.54 mm in width. Circa: 1940. SiZe 6 1/2. We cannot re-size.